A culture of inflated praise rapidly becomes corrosive, as China knows only too well from its own history. Exactly 40 years ago, on December 18, 1978, the Third Plenum of the 11th Central Committee of the Chinese Communist Party (CCP) opened in Beijing. The event marked the formal kick-off of the country’s “reform and opening” policy, and the beginning of its extraordinary rise as a global economic power. The changes set in motion by the meeting would prove dramatic, and as China sought to chart a new course and escape the cycle of violence and hardship that had prevailed through the Mao Zedong era, one of the most revolutionary changes was the embrace of new ideas. Forty years on, China is an economic juggernaut aspiring to become a world leader in technological innovation. But China’s leaders seem in danger of forgetting one of the most crucial lessons emerging from the pre-reform period and the calamity of the Cultural Revolution — that the country can only move forward if it rejects the fatuous and self-aggrandizing language of power, and embraces the open exchange of ideas and information. As the reform project began, openness meant not just openness to the countries or markets of the world, but receptiveness to its ideas. It meant being open to information, even if that information sometimes entailed uncomfortable challenges. In the early 1980s, the process of “news reform” became a crucial part of the story of opening and reform. Journalists more openly discussed the role of the media, and they spoke out against the “falsehood, bluster and emptiness,” or jia da kong, that had marked the press of the Mao era, when only the voice of the Chairman carried. Hundreds of new periodicals appeared within the first years of reform, including the more freewheeling World Economic Herald in Shanghai, at the time a base camp for new ideas about economics and economic management. The Party’s view of the press and its role has been a conflicted one through the reform era. There have been periods of relative openness punctuated by periods of renewed restraint. But in the realm of ideas and information, Xi Jinping has taken China rapidly into reverse in ways that are disturbingly reminiscent of the pre-reform era. Xi has fashioned himself as the high priest of this spiritual movement. 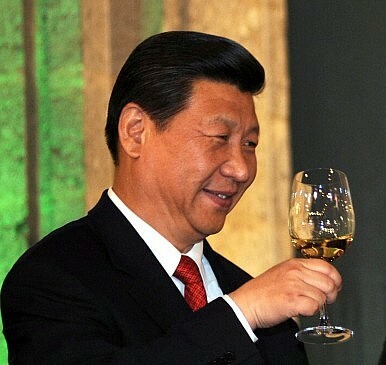 Since 2014, the state media have referred to him as “the core,” and at the Party’s 19th National Congress last year his leadership ideas were aggrandized as “Xi Jinping Thought,” the inclusion of his name being an honor no one since Mao Zedong has enjoyed. Combining the fever of the mass rally with the convenience of modern communication technology, the Chinese tech giant Tencent released a mobile phone app called “Clap for Xi” during the Party congress, allowing users to applaud along with the president’s more than three-hour speech by furiously tapping their smartphone screens. Such a culture of inflated praise rapidly becomes corrosive, as China knows only too well from its own history. During the Great Leap Forward from 1958 to 1962, local officials blindly urged on by Mao rushed to report bumper harvests to fill the vacuum of enthusiasm, resulting ultimately in tens of millions of deaths by starvation in a misguided push to industrialize. Political movements, not unlike religious revivals, must be invigorated with constant cries of “Hallelujah!” This is why, over the past few years, we have seen wave after wave of overconfidence, fueled by false claims — from viral lists of China’s technological “firsts,” to the insistence that China already enjoys a technological edge over the rest of the world, to the assertion that China now “occupies the center of the world stage.” One viral video back in May told viewers: “Don’t worry, China’s technological strength has already surpassed that of the United States, and is now first in the world.” When the 90-minute state-produced documentary Amazing China was released in March, gushing with praise for China’s achievements in science and technology, infrastructure, and military modernization since Xi came to power, it quickly became the country’s highest grossing documentary of all time. In recent months, as it has become embroiled in a trade war with the United States, China has tried to dial down the hype over its economic and technological feats. Amazing China was pulled from store shelves, and in a series of commentaries in July, the Party’s official People’s Daily warned against the pitfalls of “boastful and arrogant” discourse. At a gala dinner in early December, China’s deputy chief of mission in Washington, Li Kexin, also tried to backtrack on the bluster, telling his audience that nationalism and the Chinese media bore much blame for overblown notions of China’s geopolitical strength. These remarks gloss over the crucial fact that Chinese media, in whipping up nationalism and a sense of historic triumph, have done so at the express bidding of the Party leadership. The next month, propaganda leaders issued a directive to the news media tightening restrictions even further on reporting of a range of domestic economic concerns. They were not to report on unfavorable data that showed a slowing of the economy, nor were they to talk about the risks entailed by high levels of local government debt. And no one was to discuss, of course, the issue of sagging consumer confidence. Mindful of the 40th anniversary of “reform and opening,” Xi stressed at the first China International Import Expo in Shanghai last month that “China will not close its door to the world and will only become more and more open.” But the Party’s incessant hyping of its glories, and its controls on the media and information, now the strictest they have been at any point in the past four decades, tell a markedly different story. They tell us that China under the leadership of the most powerful leader since the pre-reform era is open to just one vision of its present and its future. One of the most important lessons of the past 40 years, affirmed right at the outset of “reform and opening,” is that receptiveness to new ideas and to reliable information is the foundation of economic and social dynamism, and an indispensable part of openness. So long as the Party’s incessant hand-clapping drowns out substance and reason, all this talk of openness is just more falsehood, bluster, and emptiness. David Bandurski is co-director of the China Media Project, and editor of the project’s website. He is the author of Dragons in Diamond Village (Penguin). What Zhang Yang’s suicide reveals about Xi Jinping’s political situation.